I don't know if any of you are familiar with Miss Elizabeth with To Be Charmed, but it really is one of my favorites. I kinda think Elizabeth and I could be kindred spirits because everything she posts makes me drool. From inspiring projects she's found elsewhere to items she's conjured up in that genius mind of hers, I love it all. 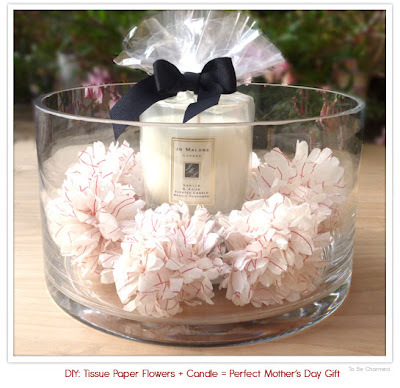 Now, I know Mothers Day is coming and Elizabeth forwarded me this lovely, feminine spin on packaging a gift. I adore those gorgeous tissue paper flowers! And to pair them with a nicely scented candle. Perfection. I can NEVER have too many candles. These flowers make me want to make some GIANT ones and hang them over the crib of my little Lady "P." This is the final feature for Featured April, so be sure to get all the details for this project here. Thanks to everyone who submitted tips! There are some ladies out there with some wicked good ideas. Happy Tuesday, everyone. Emily you are way too sweet! Thank you for all your kind words.